Here is my attempt at doing this week's SCS technique challenge "quilting", which was posted on Monday. I'm not sure if I did it correctly; but this is what I came up with. 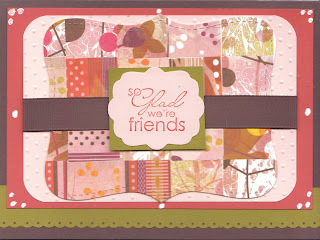 I used the scraps of Basic Grey's Indian Summer papers that I had been working with over the last few days. I cut 36 one inch random squares (thank goodness of the 1" punch!) and covered a piece of card stock slightly larger than the "Top Note" die that I wanted to use. After I had covered the entire piece, I ran it through my CB. I used Chocolate Chip, Dusty Durango, Blush Blossom and piece of green from my scraps. Not too sure I really like the way this one turned out; but I wanted to at least share something for today with you. I don't know...what do you think? Love it! I like the idea that you used the square punch. I never even thought of that! Very pretty card. You did a wonderful job with the guilting!